My once itty bitty bitten nails have really grown and become much healthier since starting the blog. They've gotten to the length where a French manicure is flattering and feminine with hand's shape, no acrylics required. I'm embracing this grace tonight. A vine of leaves over Milky Ways from Lime Crime provides the perfect elegance. I see Greek goddesses playfully sunning and drifting to sleep after barrels of sweet wine against marble pillars adorned with delicate vines and tiny pink blossoms. Additional colors used include Something Sweet, For Audrey, and Kalahari Kiss (China Glaze). Ah...just thinking about that beautiful goddess life has the sultan of sleep weighing down on my eyelids. 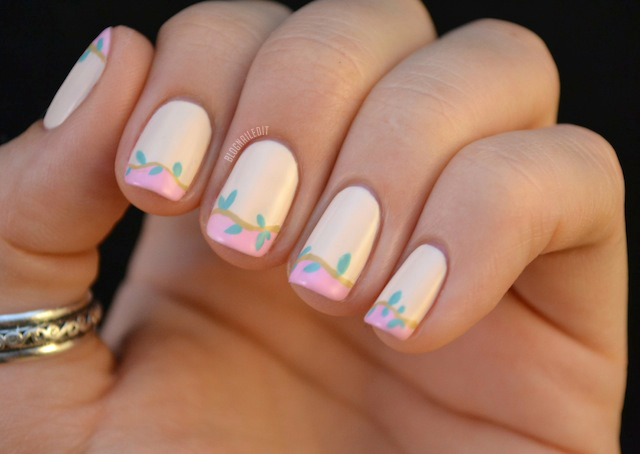 Really like this mani, too cute! Oh my, how beautiful!!! So elegant and delicate!! LOVE!! I REALLY love these. They're so fresh and delicate and girly. I love this! Did you freehand it? I'm gonna have to give this one a try! you're so talented :) these are awesome!